Giovanni Gabrieli, composer and organist, died on this day in 1612 in Venice. He had been a major influence behind the transition from Renaissance music to the Baroque style in Europe. Born in Venice between 1554 and 1557, Giovanni grew up studying with his uncle, the composer Andrea Gabrieli, for whom he always had great respect. He also went to Munich to study with the musicians at the court of Duke Albert V, which had a lasting influence on his composing style. 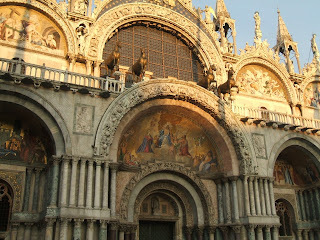 After his return to Venice he became principal organist at St Mark’s Basilica in 1585. Following the death of his uncle, he took the post of principal composer at St Mark’s as well and spent a lot of time editing his uncle’s music for publication, which would otherwise have been lost. He took the additional post of organist at the Scuola Grande di San Rocco, which was second only to St Mark’s in prestige at the time. The English writer Thomas Coryat wrote about musical performances there in his travel memoirs. Composers from all over Europe came to Venice to study after the publication of Giovanni’s Sacred Symphonies (Sacrae Symphoniae) in 1597. Using the acoustics of St Mark’s to full advantage, he wrote music for separated choirs, but specified which instruments were to be used and which choirs were to use soloists as well as full choir, in order to distinguish between the musical style of each. This was a new approach to orchestration. Giovanni made his pupils study Madrigals as well as the Venetian style of music and they took back the early Baroque style to their own countries, which profoundly affected the course of music history. In Germany, the music of Johann Sebastian Bach was founded on the early Baroque tradition, which had its roots in Venice. 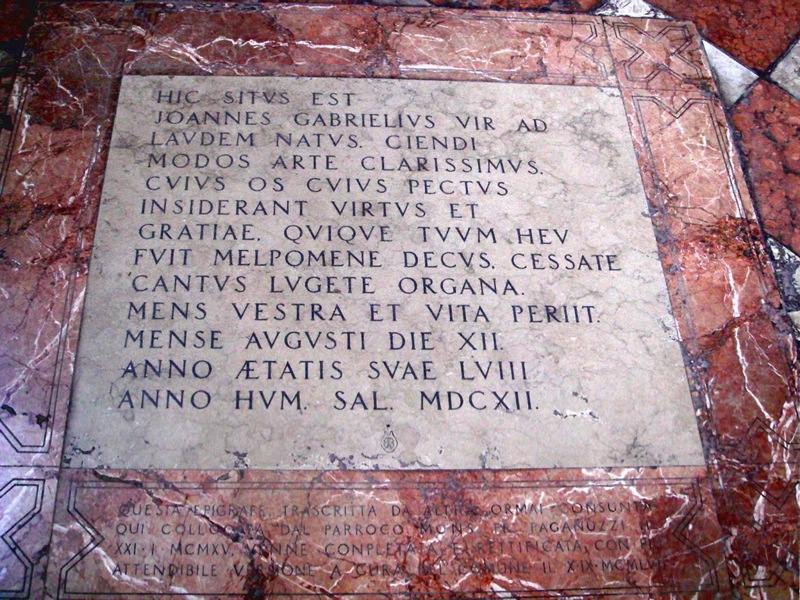 Giovanni Gabrieli died as a result of complications with a kidney stone in 1612 and he is buried in the Church of Santo Stefano in Campo Santo Stefano in Venice. St Mark’s Basilica is the Cathedral Church of Venice and one of the best examples of Italo-Byzantine architecture in existence. 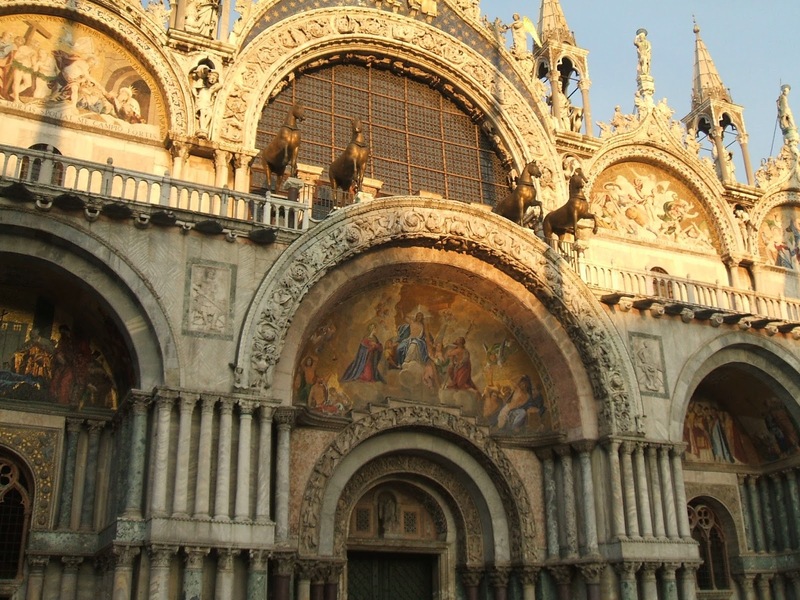 Because of its opulent design and gold ground mosaics it became a symbol of Venetian wealth and power and has been nicknamed Chiesa d’Oro (Church of Gold). The spacious interior with its multiple choir lofts inspired the development of the Venetian polychoral style used by the Gabrielis, uncle and nephew, and Claudio Monteverdi. The Scuola Grande di San Rocco was established in 1478 by a group of wealthy Venetians next to the Church of San Rocco as a charitable institution to give money to the sick and needy and their families. Tintoretto decorated the walls and ceilings of the Scuola with a remarkable cycle of paintings in 1564. 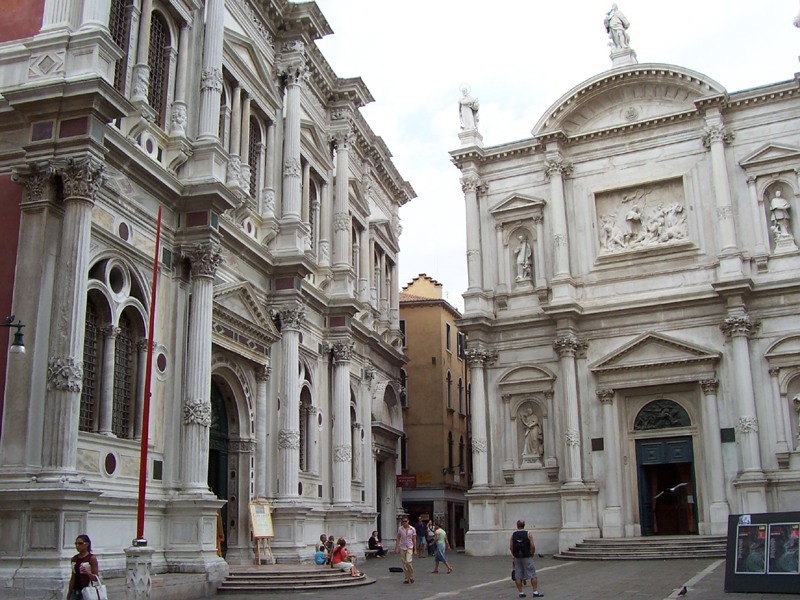 The Scuola is a few minutes walk from the San Tomà vaporetto stop on the Grand Canal.